Let's mount it. 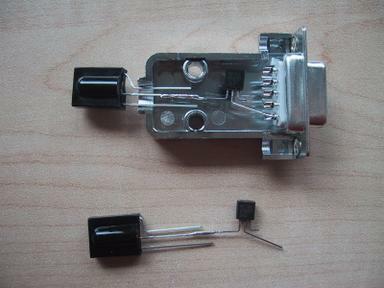 We begin with the IR receiver and the voltage regulator. [-] You should bend the IR receiver data ping as you can see in the picuture to let the pins enter the hole of the serial box (see the image below). Use tweesers to do this. [-] After having chechek the data sheet of your voltage regulator, bend and cut the pins in this shape, helping yourself with the wire cutter and the tweesers of course. The input pin must be cut very short; the ground (central) pin will be connected to the GND of the serial connector and the output pin will be soldered to the IR receiver. [-] This is how it fits together. 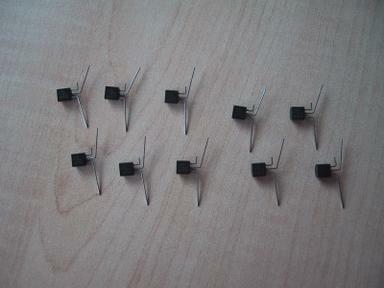 Try to find out the best possible shape of the pins for your specific serial case. 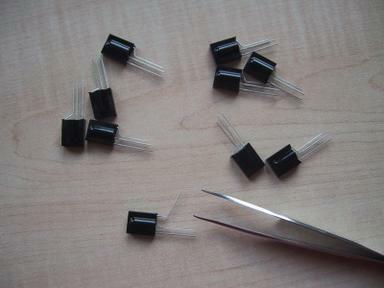 The central pin of the voltage reguator must be inserted in the 5th pin of the serial connector.